Library of America, 9781598534801, 158pp. 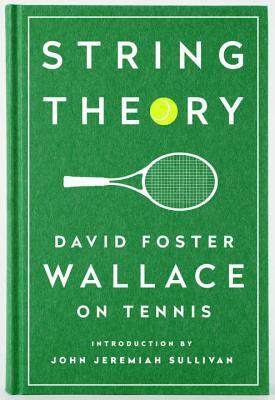 Gathered for the first time in a deluxe collector's edition, here are David Foster Wallace's legendary writings on tennis, five tour-de-force pieces written with a competitor's insight and a fan's obsessive enthusiasm. Wallace brings his dazzling literary magic to the game he loved as he celebrates the other-worldly genius of Roger Federer; offers a wickedly witty disection of Tracy Austin's memoir; considers the artistry of Michael Joyce, a supremely disciplined athlete on the threshold of fame; resists the crush of commerce at the U.S. Open; and recalls his own career as a "near-great" junior player. Whiting Award-winning writer John Jeremiah Sullivan provides an introduction. David Foster Wallace (1962–2008) was born in Ithaca, New York, in 1962 and raised in Champaign-Urbana, Illinois, where in his teens he was a regionally ranked junior tennis player. His works include Infinite Jest, Girl with Curious Hair, Brief Interviews with Hideous Men, Oblivion, A Supposedly Fun Thing I’ll Never Do Again, and Consider the Lobster. His final novel, The Pale King, was posthumously published in 2011. John Jeremiah Sullivan is one of America’s leading practitioners of the long-form magazine profile, with work appearing in The New York Times Magazine (where he is a staff writer), Harper’s (of which he is a contributing editor), The New Yorker, New York, Oxford American, GQ, and other magazines. He is the author of Blood Horses: Notes of Sportswriter’s Son and Pulphead.